This is "JJ", born on 4-15-2000 at 11:00 A M. He was about one hour old in this picture. He is a donkey, and lives in southern west virginia. His mother's name is Julie, and his dad's name is Juby. One reason he is so special, his mother had twins last year that were still born, and she also lost her first one two years ago, so he is the first one that has made it. 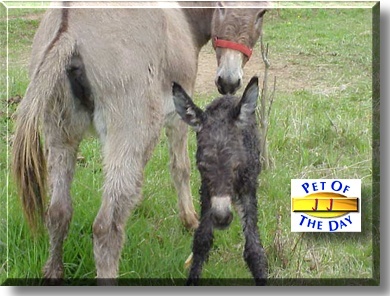 My adult donkeys are the rage of the community, and now with JJ, we are getting lots of company. :-) He will be spoiled rotten very, very soon.